This dog love card stands up on its own! The brown paper quilled dog is surrounded by a red paper with glittered specks. The dog is displayed along with the message "I WUF U" for doggy love. 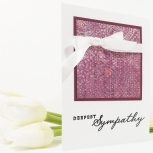 There is room on the inside of the cream coloured card for your personal message, and it will be hidden when the card is standing on display. 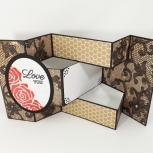 The card folds shut for mailing. This quilled dog love card is 4.25 by 5.5 inches (11 by 14 cm) and comes with a plain white envelope. The card is built from heavy weight cardstock. 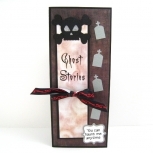 The inside is blank vanilla coloured cardstock for your own message. 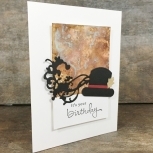 10% of the proceeds of this card will be donated to SOAR (Southern Ontario Animal Rescue) which is a small, Canadian Registered Charity that rescues dogs and assists in their foster care and adoption. The back of the card bears a shop label, signature and creation date. I currently ship to Canada and the UK.